Everywhere we look, roads are collapsing. 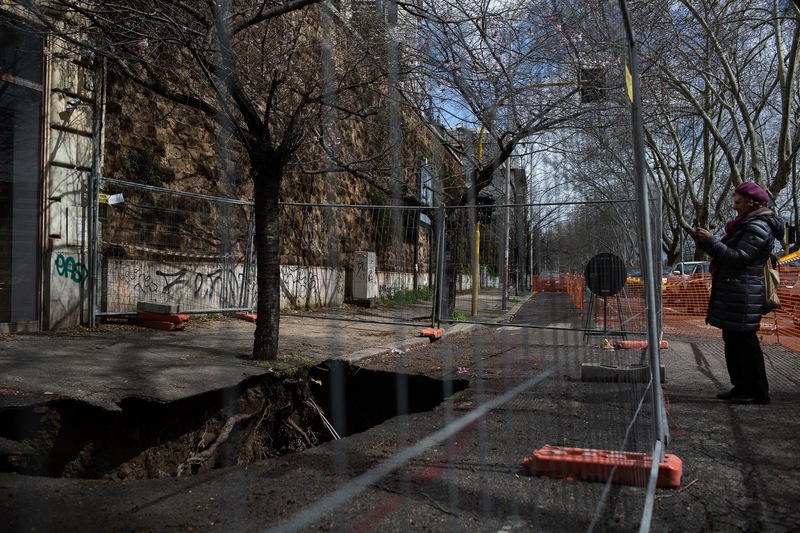 In Rome huge sink holes have developed large enough to swallow up cars. 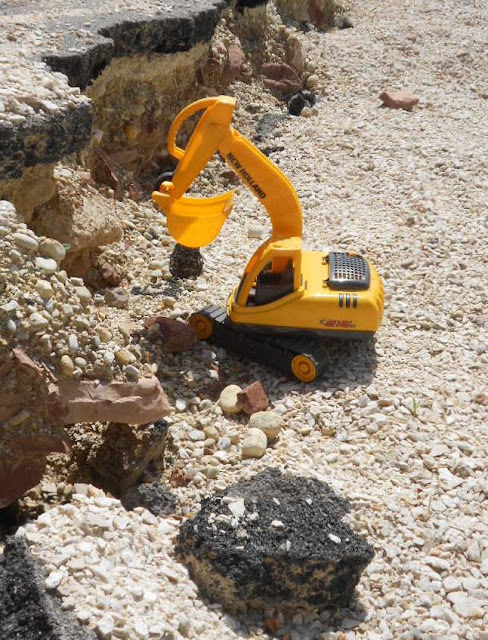 As the holes open, new Roman ruins are being discovered. In our Umbrian village one of the two roads leading out of town has had one edge of the road fall away forty or fifty centimeters from the road surface. Over the intervening months,the new cliff has been fenced off, shutting the 1-1/2 lane road down to one lane. Perhaps our local officials are planning to make it a tourist attraction, the Umbrian Grand Canyon, or just find it so interesting, they don’t want to alter it. Men working, sooner or later. warning of a drainage ditch and concrete culvert along the road’s edge..
of Perugia, at least the ones near here, are notably worse than those of Terni. 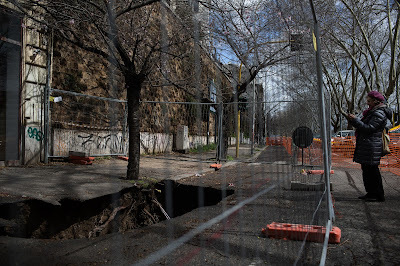 Last year, a short winding road through the village of Fiore became virtually impassible. It was “repaired” with all sorts of of road grading equipment and two or three flagmen to control traffic over a period of about a week. The road is only a kilometer or two long but it was repaved in patches, typically 40 to 60 meters long, where the worst parts were, but the good patches, while passable, were also very bad. Now they’re worse. All around us, roads, from winding country roads to superstrade (non-toll divided highways) are full of so many potholes and degraded surfaces that driving becomes hazardous, as drivers, instead of just gliding along in their lane, swerve erratically to avoid the rough patches. We’ve had a strange winter, not especially cold, except for about one week in late February when temperatures were dramatically below below normal, touching -15°C and causing a number of pipes to burst. There was an unusual amount of rain. What then was the cause? Some suggest that the abundant rain undermined the roads and the frost damaged the pavement. Northern Europe had an abnormally cold winter so how are the roads in Germany and Scandinavia holding up? Is it just an occasional bad year and things will return to normal next year? We hope so but that’s what we thought about the olive harvest and we’ve now had four bad years in a row. Perhaps it’s all the wrath of a judgmental God, fed up with what we’re doing to His creation. Italy is experiencing a long running economic crisis and has somewhat decentralized funding of government functions to the regions. 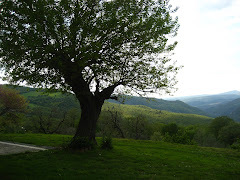 Is rural Umbria too underpopulated to afford road maintenance? If so, what about the streets of Rome, with their unprecedented potholes? Surely, there’s no lack of population to pay for its roads. We’ve heard that American infrastructure is underfunded and crumbling. At least we know how that happened. Once the masses were convinced that that government was the problem, not the solution, there was no money available for anything useful to the public, so schools, hospitals, airports and parks share the same fate as roads and bridges. Has this spread to Italy? Has climate change already changed the earth’s surface more than we thought? Does anyone have a clue? Is this a series of natural disasters or unusually bad administration? Whatever the cause, it doesn’t seem like non maintenance of roads is especially good for the economy. Delivering goods gets to be difficult, and those tourists that we increasingly depend on for infusions of cash can’t be getting the most positive impression. Italy used to be a delightful place to drive, with its winding, hilly roads and non-problematic speed limits. Truck-filled autostrade and an obscene number of speed traps on the small roads have removed most of the joy of driving. Cars have gotten bigger and their drivers proportionately worse so unmaintained roads are just the latest affront. Then again, paved roads are sooo 20th Century! Before 1970 few country roads around here were paved and then, suddenly, they all were. Driverless cars are said to be coming but they may be rendered unnecessary before they arrive. A new era is almost at hand. 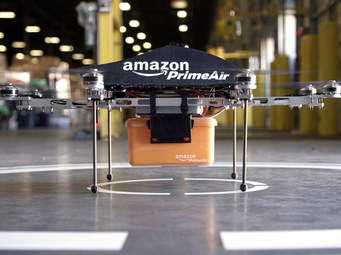 Amazon will be delivering all the merchandise we require by unmanned drones. With a complete virtual existence and all material needs at your door, who needs roads?